Burbank, Ca –- School field trips are one of the most fun aspects of growing up. Hopping on a bus filled with all your classmates heading off to explore dinosaurs at the Natural History Museum, chasing your friends around the Getty Center and shooting bad guys at the Museum of the American West play a much-needed role in youth development. In the last five years, a new, unconventional museum has become part of the school agenda: the Martial Arts History Museum in Burbank, CA. The Martial Arts History Museum, which is located in the heart of the film production capitol of the world, offers a new twist on museum visitation. Founded in 1999, the museum is not about the punch and kick, nor is it about sports, rather, it is about Asian culture, tradition, art, music and history. It is the only museum in the San Fernando Valley that focuses on bridging the gap of understanding of diverse cultures. Filled with traditional Chinese lions for dancing, Samurai uniforms, Thailand musical instruments and even anime, the museum explores the role the martial arts played in each Asian country and how it influenced their culture and way of life. Through its various historical timelines spread across the facility, it explores how Asian history became part of American history through films, television and even through the Olympics. “Artistry and history are a big part of the martial arts. The samurai, who ruled Japan for many centuries, also helped open the doors to music, artistry, poetry and plays. The Filipino's hid their martial arts teachings in their dance routines and Hawaiian Lua warriors utilized shark teeth for everyday life as well as battling their enemies,” notes museum president Michael Matsuda. As the gold rush era of the mid 1800s attracted pioneers from the American East Coast, famine took its toll on China as thousands of new immigrants made their way to the Western Coast line in search of a better life. With them they brought their art, food, culture, tradition and their martial arts. Nearly 100 years later, it was the martial arts that became part of Hollywood films and today, nearly every action movie, comic book or animation includes martial arts. 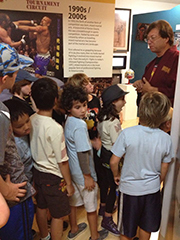 The Martial Arts History Museum was founded by former Disney graphic designer and martial arts historian Michael Matsuda. With the help of Paul Wee, Emmy-Award winner from the Simpsons, artists from Dreamworks and Halloween designers, the museum is designed for kids to enjoy and explore. Tours divide the groups into 20 kids per section and the history of the arts is explained by its docents. Videos within each area adds to the experience as well as specifically designed photographic and colorful wall displays enable children to connect with their particular style of learning. The museum is a non-profit 501(c)(3) organization and is experiencing growing pains as it heads into its fifth year in Burbank. “The word is getting out by the kids about the museum. Granted, the Natural History Museum and all the other museums are great places to go. But, the Martial Arts History Museum provides a connection with the kids that they really enjoy. A larger facility is greatly needed to accommodate the growing number of visitors. We had been in talks with the city of Burbank and County Supervisor Michael Antonovich over the past year, but to no avail,” says Matsuda. The Martial Arts History Museum brings in thousands of school children every year with that number on the rise. Unless a larger location is found, a waiting list will have to be instituted in the next year. “As one parent put it, this is a real gem. It's a wonderful place that is deserving to be a major part of the community. Kids need to have both fun and educational places to visit and the museum is providing that extra alternative. It is my hope the city will see that need,” adds Matsuda. One of the goals of the museum expansion would be to add a 200-seat theater that would accommodate cultural performances, music, movie premieres and more. “Please consider writing your councilman of your city to look into finding a larger place for the museum. It would be a tremendous addition to the area,” concludes Matsuda. To support the museum, tax-deductible donations can be sent to the Martial Arts History Museum, 2319 W. Magnolia Blvd., Burbank, CA 91506. Website is Mamuseum.com or call (818) 478-1722. 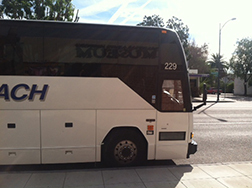 Tours can be booked at the same number.